The five people on trial for the murder of former Jaffna District MP Nadarajah Raviraj were acquitted of all charges in the early hours of yesterday (24) by a Special Jury at the Colombo High Court, after an extraordinary final day. The seven-member jury’s unanimous verdict was conveyed shortly after midnight on Friday. Accordingly, three former Sri Lanka Navy intelligence personnel and two members of the Karuna faction were acquitted of all charges. High Court (HC) Judge Manilal Waidyathilake then ordered the release of the accused, three of whom were present in court when the verdict was announced. The accused were Prasad Chandana Kumara, Gamini Kumara, Pradeep Chaminda, Sivakanthan Vivekanandan alias ‘Karan’ and Xavier Royston Christopher Hussein. Charges were initially filed against six accused. However, one of the accused, Palanasami Suresh alias ‘Sami’ was deemed to be deceased. Only the first three accused, who were Navy intelligence officers, were present throughout the trial. The other two accused from the Karuna faction, were absconding. 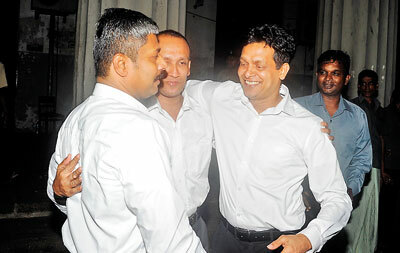 However, the Colombo HC had ruled that the trial could proceed without the two accused who would be tried in absentia. The jury, initially, unanimously acquitted the three accused present in court, of all charges. HC Judge Waidyathilake then inquired from the jury if all the accused, including the two who were absconding, were acquitted. When the jury replied it was yet to take a decision on the two remaining accused, the judge instructed them to retire to the jury room and return with a verdict regarding them. Later, the jury returned with their unanimous decision to acquit the remaining two accused. Court proceedings concluded thereafter around 12.20 am. Charges filed against the accused by the Attorney General’s (AG) Dept included conspiracy to murder, murder and aiding and abetting murder. Police Constable (PC) Preethi Viraj Manamperi, who was also initially charged with the murder, later turned State witness and granted a conditional pardon. Back in September, Counsel for the accused, Anuja Premaratne requested the Colombo High Court for a trial by a Sinhala speaking special jury. Counsel for the aggrieved party, K.V. Thavasara, objected to this, arguing that, some of the charges against the accused had been filed under the Prevention of Terrorism Act (PTA). However, after considering the matter, HC Judge Waidyathilake ruled that the accused had a right to ask for a jury and granted the request. The special jury comprised of persons holding senior positions in the State sector. Senior Deputy Solicitor General Rohantha Abeysooriya appeared for the AG, while Counsels Anuja Premaratne and Rasika Balasooriya appeared for the Accused. Mr. Raviraj and his bodyguard, PC L.M. Lakshman were shot dead on November 10, 2006, in Narahenpita.